A range of artefacts dating from the mesolithic to the bronze age have been discovered in the Indonesian province of Papua. 22 July 2007 (Brunei Times) – With gunpowder invented in nearby China, and cannons brought with the colonizing powers from Europe, it’s no surprise that cannons appear in the archaeological record in this part of the world. This article talks about cannons in Brunei. … not everyone knows that cannons were already being manufactured in Brunei at least 500 or 600 years ago. Many cannon moulds have been found at archaeological sites throughout the country. Historical records also indicate that cannons had been used in Brunei. The historical records of Antonio Pigafetta when he was in Brunei as Magellan’s chronicler in 1521 stated that “in front of the Sultan’s palace, there was a thick wall of bricks, with towers in the manner of a fortress on which mounted fifty-six brass and six iron cannons”. !The Bruneian cannons, known in the Brunei vernacular as bedil, are used not just on land but also on board Brunei ships. A record of the Spanish attacks on Brunei stated that the Brunei ships used cannons. !The origin of the cannons is unknown, they were most probably of Chinese and European origins. The first cannon in Europe probably appeared during the Islamic era in Spain. Brunei cannons probably are more influenced by our relationship with the Chinese Empire. !In Brunei, the art of casting metals had been in existence for many centuries. As far back as 1225, a visiting Chinese official, Chau Ju Kua, found that the Bruneians had been carrying swords and metal armour made of bronze when attending funerals. It was said that during the era of Sultan Bolkiah, the fifth Sultan, 40 Javanese metal craft experts had been brought back to teach Bruneians their craft . Cannons played important roles in Brunei’s history. They were used as Brunei’s main defences and a good number were positioned at the mouth of the Brunei River and were placed there until the British came to Brunei in 1846. Some famous cannons bore names, such as Si Tunggal and Si Dewa. These two were taken by the Suluks during the Brunei civil wars and were later taken to Manila. Another well-known cannon during Sultan Bolkiah’s reign was Si Gantar Alam which was used during the attacks on Luzon and Manila. The Brunei cannons had their own attributes. In the manufacture of the cannons, the local craftsmen would pay attention to eight main parts of the cannons known locally as the batang (barrel), muncung (mouth), kancing lumba-lumba (trigger), pistaran (sightscope), sumbu dan gargasa (ignition), gamban (barrel end), gaganok (holder) and sangka (holder). Each part would be intricately designed with Bruneian motifs, thus distinguishing Bruneian cannons from other cannons in the world. Cannons are not just used for defensive purposes but play important role in the royal courts. Cannon shots are fired on many important royal events, with different numbers for each event. The highest are obviously events connected to His Majesty the Sultan and Her Majesty Raja Isteri, with 21 shots. Read more about the cannons of Brunei. 15 July 2007 (Jakarta Post) – A story about the Kris, or keris, the characteristic wavy-bladed knives of the Malay world, in conjunction with an exhibition in the Neka Art Museum in Bali. It’s interesting that the story notes how the blade is honoured in ceremonies involving the Hindu god, Brahma – indicative of the unique syncretism of Hinduism in Bali. Whether created by human hands or of supernatural origin, krises are believed to be physical manifestations of invisible forces. Forged in fire but symbolic of water, a kris represents a powerful union of cosmic complementary forces. A distinctive feature of many krises is their odd number of curves, but they also have straight blades. Krises are like naga water-serpents that are associated with irrigation canals, rivers, springs, wells, spouts, waterfalls and rainbows. Some krises have a naga head carved near their base with the body and tail following the curves of the blade to the tip. A wavy kris is a naga in motion, aggressive and alive; a straight blade is one at rest, its power dormant but ready to come into action. Different types of whetstones, acidic juice of citrus fruits and poisonous arsenic, bring out the contrast between the dark black iron and the light-colored silvery nickel layers that together form pamor, damascene patterns on the blade. These motifs have specific names that indicate their special powers: udan mas (golden rain) is good for prosperity, wos wetah (unbroken rice grains) brings well-being. The kris is an important family possession and considered to be an ancestral deity, as weapons often play critical roles in the rise and fall of families and fortunes in history. Heirloom krises have proper names that describe their power: Ki Sudamala is Venerable Exorcist and repels negative forces, Ki Baju Rante is Venerable Coat of Armor and spiritually protects one wearing it. In Bali, an heirloom kris and other such metal objects are presented offerings every 210 days on the day known as Tumpek Landep, which means “sharp”. They are cleaned, displayed in temple shrines, and presented with incense, holy water, and red-colored food and flowers to honor Hindu god of fire Brahma. This is followed by prayers for a sharp mind to Sanghyang Pasupati, the deity who empowers sacred objects and defeats ignorance. Read more about the kris in Balinese life. 4 April 2007 (Thanh Nien News) – What is the best way to deal with a situation like this. The state decides to build a dam. Two months into the construction of the dam, a trove of archaeological artefacts are found, smack in the middle where the water catchment is supposed to be. Hopefully, the Vietnam Archaeology Institute will be able to organise a salvage dig. A farmer in central Vietnam has collected over 1,000 suspected Neolithic Period artifacts found locally but the site of his farm is soon to be submerged under a dam. Dr Nguyen Gia Doi of the Vietnam Archaeology Institute said the objects might date back to 3,500 â€“ 4,000 BCE after visiting Nguyen The Vinhâ€™s farm in the central highlandsâ€™ Dak Nong province. 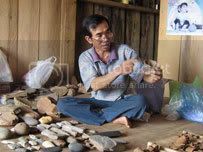 Vinh has shards of pottery and tools like axes and spearheads, chisels, and pots all found inn the area in the last four years. 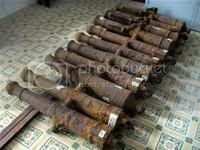 22 March 2007 (Viet Nam Net Bridge) – It may sound confusing: cannons are excavated from Binh Thuan province, the museum buys them in the open market and sells them back to the said province. It would seem that there is no automatic protection over archaeological discoveries – a case of finder’s keepers? The HCM City-based Museum of History plans to sell to the southern province of Binh Thuan 12 of the 24 cannons from the Nguyen Dynasty unearthed in Binh Thuan in 2005. The Vietnam Institute of Archaeology and the Daknong Province Museum have announced the results of excavating remains in Dak Wil Commune in the province’s Cu Jut District. The archaeological site was discovered for the first time in December of last year, and excavated last month. According to the results of surveying, there were four groups of stone relics in two hectares. The archaeological delegation collected 127 objects such as stone axes, graters, and material stones in 53 square meters. In addition, there were 400 pieces of pottery and fossil sea animals, which dated back 4,000 years. Scientists in Indonesia are preparing to auction tens of thousands of artefacts salvaged from a sunken ship off the coast of Java. The items, which are believed to be more than 1,000 years old, include ceramics, tombstones and swords. Salvaged after 1,000 years at the bottom of the sea, the haul includes bowls from China, Thailand and Vietnam; perfume bottles from Persia; and swords and tablets engraved with Koranic inscriptions. 30 July 2006 (The Star) – Three shipwrecks, including what could possibly be the oldest European shipwreck in the region have been discovered along the Straits of Malacca by an Australian marine archaeologist. He also revealed pictures he had taken of cannons, cannon balls, bones of animals that were consumed on the ships and broken Ming dynasty porcelain. Dr Flecker is the managing director of Maritime Explorations and has been involved in underwater explorations for the past 20 years. He said the warship was located in an area between Pulau Upeh and Pulau Panjang off the coast of Malacca. â€œSo far, based on our research which has been done some four nautical miles from the coast of Malacca (within Federal waters), the ship could have been a Portuguese vessel under the command of Admiral Coutinho. It sank in 1583 during a battle.